West Side 2nd Grade In Outer Space! Ms. Mullins' 2nd Grade Class - Back: Grace Campbell, Riley Poteete, Lora Roberts, Lily Guenther, Karina Fann, Austin Mitchell, Rachel Choate. Front: Alexis Freels, Brady Davenport, James Vassar, Sofia Gomar, Cameron Decent. Mrs. Naylor's and Ms Mullins' 2nd grade classes are learning about space and the solar system. 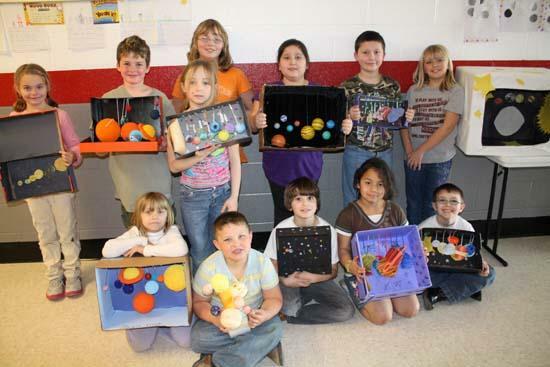 Each student had the task of creating a model of the solar system and there were some very creative ideas. From styrofoam balls to pom poms, each had its own unique personality.